Have you ever made mini meatloaf muffins? 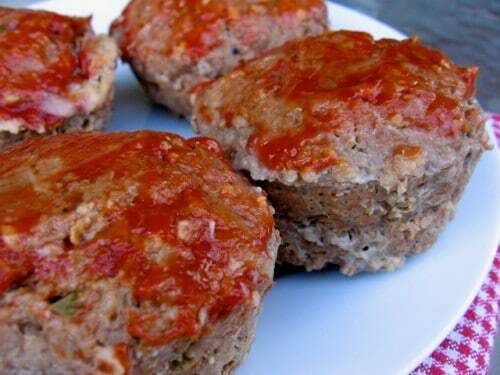 You just take your favorite meatloaf recipe and bake it in muffin tins and voila – meatloaf muffins! My current favorite meatloaf has just 6 ingredients – it’s a modification of Lipton’s Souperior Meat Loaf made with a package of dry onion soup mix – a staple in my Mom’s pantry when I was growing up. Using a package of soup mix ensures that your meat loaf will be full of flavor without all the work involved with peeling and chopping onions. If you are a purist and prefer to not use onion soup mix, you can always make this WW Meatloaf Recipe and just bake it in muffin tins instead! To make my meatloaf muffins a little skinnier and healthier, I use quick cooking oats instead of bread crumbs, egg whites instead of whole eggs, and diced tomatoes instead of water. According to my calculations, these mini meatloaf muffins have 255 calories, *6 Weight Watchers PointsPlus, *5 WW Freestyle SmartPoints. Add some creamy low calorie mashed potatoes and peas or green beans to round out your dinner. If you’ve made these Meatloaf Muffins, please give the recipe a star rating below and leave a comment letting me know how you liked it. 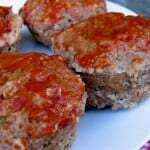 A fun way to make meatloaf - in muffin tins! In a large bowl, mix all ingredients, except the extra ketchup, and mix well. Divide the mixture into 8 even portions and form these into balls. Lightly press the balls into 8 cups of a standard 12-cup muffin tin. Brush the tops of the "muffins" with ketchup, if desired. Bake uncovered for 25 to 30 minutes or until the tops have browned and the meat loaves have cooked through. These mini meatloaf muffins can be cooked, cooled and then wrapped in foil and placed in the freezer for a future quick and easy dinner. Found this on Pinterest. Question on measurements: 1/4 c quick cooking oats or 1/2 c.? It should actually be 3/4 cup of quick cooking oats. I’ve fixed the recipe. Sorry about that!! Is Freestyle Smart Points the same as just Smart Points? Hi Connie, SmartPoints for the new Freestyle program may be the same as Beyond the Scale SmartPoints depending on the recipe. With the new WW Freestyle Program, WW added more Zero Points foods so recipes containing these foods will have lower SmartPoints. Hope this makes sense. How many freestyle points am i allowed per day? Delicious! My college age son didn’t know they were “light,” and he commented on how good they were. Comfort food without the guilt! Looking forward to trying other recipes. Thanks! Oops! Posted review but forgot to rate. 5 stars! Is it six points per “muffin” or the entire batch? It’s 5 Freestyle SmartPoints per meatloaf muffin. – Hope this helps. Question- your recipe called for 2 lbs of ground beef, I am using regular size muffin pan but it is more than 8 muffins worth? Is this recipe for 16 muffins? Or only 8? I made 8 muffins. But you can make as many as you like. If you make more, the cooking time may be reduced since they will be smaller. Martha, Wanted to share a WW point for this recipe. I’ve made this several times; sometimes with the ground beef and sometimes with the ground turkey. My family likes both versions. What I’ve discovered is these mini-meat loaves freeze well after baking (just don’t top with the ketchup). I make a triple batch, then wrap them in “Press-In-Seal” first, then an aluminum foil wrap. The Aluminum foil keeps them from getting “freezer burn”. They last well for 6 months in the freezer. When ready to use them, defrost in the refrigerator, top with ketchup if desired, and reheat in a toaster oven or microwave. They are great when you have a busy day; and need a quick, healthy WW meal in minutes.